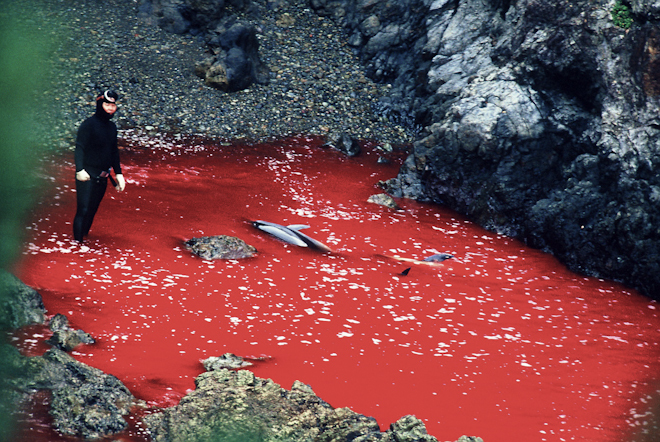 Dolphin slaughter, Taiji, Japan. Image via itseasytopretend. Between the months of September and May, some 20,000 dolphins, porpoises and small whales are slaughtered off the coast of Japan. They are disoriented using sound waves and ushered into lagoons where those suitable for transfer to sea life centres are selected and separated from the rest of the pod. The remainder are stabbed to death and their corpses sold for meat. I must confess, I thought long and hard about whether to lead this post with a photo of the slaughter, like the one taking place in Taiji (above) as you read this piece. I want my writing to prompt emotion and thought, not the images I choose to annotate my work. But during that process, I realised that if I led this post with a photo of a cheerful Disney dolphin, I would be contributing to the very problem I’m trying to highlight. Part of the reason that mass slaughter of marine life is taking place in Japan is the demand for captive dolphins in aquariums across the world. Aquariums that we visit, believing that the animals we watch jumping through hoops and balancing balls on their noses are happy and do so willingly. They don’t. That’s why I want you to be offended. I want you to look at images of dolphins being rounded up and killed with bayonets. I want you to see the fear in the eyes of a highly intelligent creature who has been separated from the family unit, transported and placed in confinement for reasons he or she can never hope to comprehend. I’m sorry to say it, but pushing these images, and forcing people to confront them, is the only way to make people realise that actions have consequences. That by visiting sea life centres, each one of us is creating a demand for dolphins and porpoises in captivity, which leads to directly to scenes like those you’d prefer to avoid. Ask yourself, and your friends this. If you can’t look at pictures of an animal when it is being captured, how can you justify looking at it, taking your kids to see it, laughing and enjoying it’s apparent playfulness when it’s arrived at it’s destination? That’s what I call offensive. ← Women In Combat Roles: Reality. Check?